Shawn Quirk's Air Conditioning Installation Project 3 — The New Millennium.... Falcon! At this point, I told myself (out loud) “I’ll build a better mouse trap.” No more phone calls, no more questions with no answers. Just Do It. I went to the local A/C shop and inquired about drier locations, and they advised that there is no issue mounting the drier inside or outside of the engine compartment, and that for the most part, heat is not an issue. I choose to forgo mounting the drier up front, I’d stick it on the firewall by the starter solenoid (reference picture: Lower Left). I used hoses (supplied) with 45 degree elbows to come directly out of the condenser and through the radiator core-support by drilling two holes (reference picture: Lower right). I forget what size holes I drilled, I guess I thought I needed more room to have clearance around the hoses (amateur mistake), but they were a little too big and the supplied grommets didn’t fit. The drilling is a bit nerve racking at first, but the holes are easy to bore, just obtain a good set of hole-drills made for steel. Measure carefully (eight, nine times) and if you get it right the lower hole will be just to the engine-side of the lower battery tray support, with good hose clearance to the firewall-mounted drier. The upper hole clears the battery easily. When the condenser is in position, it’s a tight fit between the it and the painted valance. (Reference picture: Below). They actually touch, but if you look close, I put some rubber in between the valance and the condenser. Minor detail, just annoying. 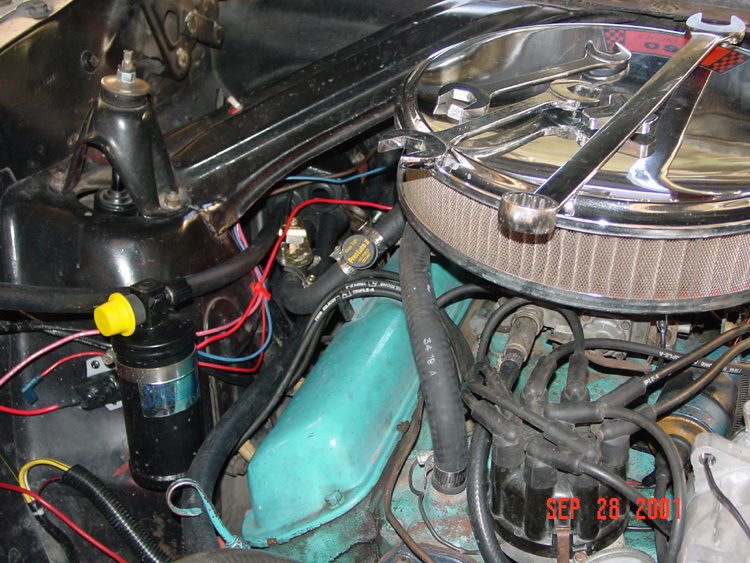 I also routed the hoses around the engine compartment differently than the instructions reflected. More on that later. Ultimately these condenser/drier issues were not a huge snafu, when compared to the previous compressor “contest.” Oh yeah, one more thing, rather strange; it appears that the spacing between the radiator and condenser (and compounded by the fan shroud probably) is such that when I hit around 65 MPH, I get a humming sound. I Can’t explain the sound other than ‘humming’ but its a sound that made me re-pack my wheel bearings, thinking they were shot. Passengers wouldn’t notice the sound, owners will. Both the inlet and return heater hoses route through the aforementioned bulkhead (reference picture: Bulk Head) that the A/C hoses go through, not through the OEM heater-hose holes. The inlet heater hose (hot, going to the heated core) on a 64’ two barrel runs from the engine up to the carburetors’ thermostatic spring housing (choke system) before it goes through the firewall. But once you have the A/C hoses in place it becomes difficult to make the sharp bends from thermostatic spring housing bracket, to the Vintage-supplied heater-temperature control valve, then to the bulkhead holes. Throw in the radiator flush ‘T’ that I use and it becomes so tight and misaligned that the heater hose kinks before you can get it into position. I contemplated simply running the inlet hose straight from the engine to the ‘T’, temp-valve and then bulkhead (my ‘Bird runs a bit fat anyway, and I never use the choke) but I quickly dismissed that idea. So I went to Pep Boys and rummaged through the various OEM hoses they have (hoses for every car imaginable) until I found a combination of hoses with bends that matched the path my hoses needed to take. You can see this fairly well in (reference picture: Drier Mount), look for the Prestone ‘T’ cap. These hoses work great and look Ok, so I’m happy with it, however instead of 2 bucks worth of heater hose, I now have over 20 bucks in ‘custom’ hoses. Once all of the above assemblies are in place, you’ll route the various hoses to and from all the component connectors. All the required hoses are provided, and have plenty of length for your cut-to-fit. I looped the hoses around and behind the air cleaner to the compressor, which gives them added length, so if I ever have to pull the engine, the compressor can simply be left connected and lifted out of the way, instead of having short hoses in front of the engine, which is how Vintage routes. But I think the A/C routing I used looks clean (humble opinion here) and as noted, could be helpful during an engine swap. You can see this later in the charge and leak-test pictures. You’ll notice I run a chrome air-cleaner. Ages ago the original air cleaner disappeared, and I’ve been trying to locate a stock OEM unit, one with the OEM hot-air duct from the exhaust manifold to the snorkel. Even if I find one, there is probable no way could I squeeze the hot air duct through the A/C and heater hoses population. Oh, well, I’ve recently obtained an air cleaner unit without the hot air duct. Suffice to say, Vintage did a good job with their under dash components; except for some minor* issues documented below, these assemblies fit right under the dash - yes, a “Sure fit”- and look clean (well hidden, actually) and are pretty cool to look at. * By ‘minor’ issues, I mean little tribulations requiring minimal ‘tweaking’ that one would expect to make anything fit into an old Falcon. 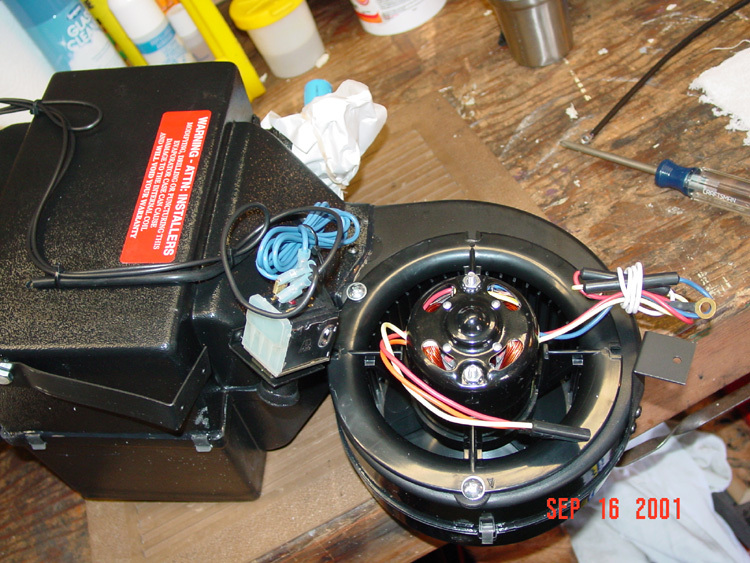 Pulling the OEM heater box and fan assembly (Reference picture: OEMHeaterBox) out is simple; refer to your Falcon manual(s) for instruction. What a trip it is seeing this assembly after so many years tucked under the dash. The heater box itself was in almost perfect condition, is a very well made and heavy duty unit, made from fiberglass or something. On the other hand, the plenum (which the defrost ducts are connected to) is made from the same cheesy cardboard stock as the glove-box assembly. All the rubber seals were tattered, and my dad did some creative duct-tape repairs some years ago. Love that duct-tape, that crap will fix anything. The whole assembly that is pictured is now retired, it all gets replaced with Vintage Air stuff. Anybody want to buy a nice, stock heater box? Once you’ve yanked the OEM heater box assembly, you plug the fresh-air inlet hole (reference picture: FreshAirInlet). Vintage provides a plastic cover to screw in place, over the hole. It’s a bummer you plug this fresh air inlet; the Vintage system is a recirculation system that does not use fresh air, but more on the fresh-air thing later. A series of pictures will tell the evaporator installation story (reference pictures: EvapCables, EvapInstall & EvapFan), but there are a couple things to watch out for. The assembly bolts to an existing heater-fan mounting hole, and another bracket screws into the cowl. The bracket that mounts to the fan-hole had to have the bolt-hole drilled in a lower location, maybe a ½ inch difference, (reference picture: EvapBracket) to get the hoses and evaporator plumbing (reference picture: EvapPlumbing) to line up. The bracket that screws into the cowl (reference picture:EvapToCowl) can be adjusted to accommodate this with little problem, however, a rather bothersome issue came up after I drilled and mounted the evaporator. The two screws seen in the this picture go though the cowl and can be seen through the fresh air slots in front of the windshield! (Reference picture: SCREWED [not a very clear picture]). Regardless of the ½ inch I moved the unit (mentioned above), these screws would come through. Freakin’ swell, two steel screws out in the open air. My Falcon has no cowl rust whatsoever, but we’ve all seen what can happen in there; I was pissed. Damage done, I went and bought some high-grade stainless steel screws, and once tight, I put a dollop of clear silicon around each screw, through the slots. Pisses me off again as I write this.